For some dogs, taking a ride in a bike trailer can be a wonderful experience. Getting a dog bike trailer can be one of the best Christmas presents for dogs along with other things that make them happy like cooling pads for dogs, cooling vests for dogs or an outdoor dog kennel to play in. But choosing the right dog bike trailer can be a little more challenging, because there are many different ones to choose from, and you might have a hard time figuring out whether or not one bike trailer goes with your bicycle. That’s why this buying guide was created. This buying guide will show you how to choose the best dog bike trailer, as well as reviews some of the top choices out there. Let’s get started by looking at the top five dog bike trailer models that are currently on the market. These are five of the best pet trailers for bikes that are on the market right now. They are appropriate for many different breeds including Labrador Retrievers, Golden Retrievers, German Shepherds, Boxers and even Huskies. Some larger dogs such as Great Danes may have trouble finding the right size, but you do have some options here. What is a Dog Bike Trailer? What Type of Flooring Does it Have? How Portable is Your Bike Trailer? How Easy is Your Bike Trailer to Use? First up, this pet bicycle trailer from Solvit is one of the best options when it comes to a bike trailer for your pet. Not only does this trailer look amazing, it also has some terrific features that will make it a lot easier for you to This is one of the most comfortable rides out there for your pet, optimized to be lightweight as well as stable, with easy access through the front or rear and plenty of features for letting in sunlight, blocking the wind or other elements and much more. This bike trailer for your dog has two doors with mesh screens as well as a waterproof layer that allow your dog to pop in at either point and then you can zip them up to give them a ride, allowing them to look out through the windows or get a little bit of sunlight through the included sunroof that you simply unzip. It’s constructed from extremely heavy duty polyester in the floorboard is waterproof covered with a comfortable pad. The tires are prefilled with the perfect air pressure and are 20 inches to give you added stability. The aluminum frame allows you to pick up the bike trailer and load it into your car if necessary, while still staying on the ground over bumps and holes in the road. There is more to love about this bike trailer as well. For example, it has an adjustable safety leash the keeps your pet secure while they are riding, as well as reflectors on each side of the cabin and on each of the wheels to make sure that you’re totally visible at night, especially when car headlights hit you. This is also extremely portable because it folds down so that you can pick it up and store it easily in a closet or put in the back of your car if you need to transport your pet somewhere. It’s also really easy to clean and take care of. Schwinn is a well-known brand when it comes to bicycles, and they also make some of the best pet bicycle trailers on the market. This particular model is no exception. With a brightly-colored design, and lots of features that will make carting your pet around a pleasure, this pet bike trailer is one of the best decisions you can make for all sorts of breeds including French Bulldogs, Beagles, Poodles, Yorkshire Terriers and more. This bike trailer has plenty room for your pet as well as storage for things like your pooper scooper and poop bag, and it is compatible with a dog ramp if your pup has a hard time getting up onto high places. This is like a playpen except that it is portable and rolls on wheels, and since it is made by Schwinn, you can be sure that it is of the highest quality. This bike trailer has a unique folding frame design with quick release wheels that packs up really tight so you can put in the back of your car or in a closet when you are not using it. It is made from steel coupler that attaches to almost any bicycle out there, with a particular emphasis on Schwinn bicycles of course, with aluminum rims, air-filled tires that inflate with the standard pump, an internal leash that you can adjust yourself and an extremely strong framework that will hold pets up to 50 pounds. There is a bug screen, as well as a waterproofing layer, plenty of air ventilation and a safety flag so the cars can see you during the daytime. There even reflectors on the tires so that cars can see you at night as well. 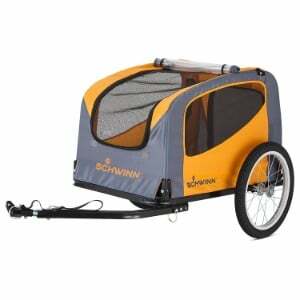 This Schwinn bike trailer allows you to attach the trailer to your bike in seconds and go anywhere with your pet. It is comfortable, provides a smooth ride even when the road isn’t exactly even, is snug and easy to control and features durable materials that are going to last you for really long time. This pet stroller and trailer from Best Choice is the next dog trailer for bike that we’re going to discuss. Although this is not for every breed out there, it does support pets up to 66 pounds which is a little higher weight limit than the others that we have reviewed so far. However, just like choosing a dog bed, dog crate, dog playpen or dog house, you want to make sure that you get the right size specifically intended for your pet. That is going to include small to small-medium size dogs, but excludes a lot of breeds that are medium-sized or larger. However, if you do have a small dog, then this could be the perfect trailer for you. This has no adjustable leash inside of the unit that you can attach to a dog collar or dog harness, as well as a steel frame that is covered with water resistant polyester that protects your pet from both the sun and the rain. It also has a 2-in-1 bug screen as well as a cushion inside the unit to keep your pet comfortable. You can always remove it and replace it with one of your own, but it is perfectly fitted for the trailer, and your pet will really enjoy sitting on it while you pedal. It also comes with built-in brake system, safety reflectors on the wheels and a safety flag as well as a hitch to allow you to hook it up to your bicycle. What is really great about this pet carrier is that it has plenty of windows for your dog to look out of. Sometimes, trailers can be a little restrictive, which can make your pet anxious about riding in them. But the windows almost make up the entire bike trailer. Your pet will be able to see out of either side as well as through the front, and there is not only a window on the back, there is a full door that unzips completely to allow your pet easy access. 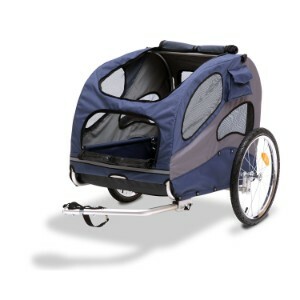 This Pacific Cycle bicycle trailer is another terrific option that you can use to take your dog with you when you go on a bike ride. Some of the accessories like GPS tracker for dogs or dog activity monitors can be extremely useful for letting your dog out to the yard to play, or taking them for walks, but taking your dog for a bike ride on a secured large dog bike trailer is one of the best ways to get them to experience new scenery and spend time with them. Your dog may not spend a great deal time exercising if you take him with you on bike rides, but it is perfect for older dogs, and even younger dogs will enjoy the ride every once in a while. This particular bicycle trailer has everything that you could want including performance and style. It has molded rims with 16 inch pneumatic tires and you can release the wheels instantly and fold the frame in seconds. That makes it very easy to take on a camping trip, go hiking with your dog or simply stow it away in a closet when you are not using it. For people to live in small apartments have a limited amount of space, this is an extremely useful feature. However, there are a lot more cool things about this bike trail within just the portability of it. It features a two-in-one canopy that both protects against weather like wind, rain and snow, as well as a bug screen that keeps your dog protected while they are inside. It has a very versatile bicycle coupler that attaches to almost every bicycle easily so you can have it set up in seconds. In addition, it will support any dog up to 40 pounds and the floor is very comfortable, completely waterproof and the design prevents shocks from going down the road so it has added stability as well as more comfort for your pet than some of the other models on the market. From Aesom comes a great bike pet carrier that you will find really easy to use. There are a lot of great features that come with this bicycle dog trailer, and lots of things that make this one of the best choices for bike trailers currently on the market. 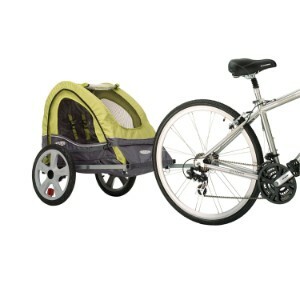 However, you do want to keep in mind the maximum weight for this bike trailer is just 66 pounds. That means that it is going to be pretty much restricted to small dogs. You may be able to get some medium dogs onto the bike trailer, but if they go over 60 pounds or so, then you should definitely get a different one. However, 60 pounds is plenty of maximum weight for the smaller dogs out there. You also love how portable this bike trailer is. It literally folds down in seconds once you get the hang of it, and it has a removable plastic cover to protect your pet from the weather if it starts to rain. In addition, both the front door and the back door are covered by mashed so your pet is protected from bugs and prevented from running off, while zippered doors that are easy to open allow for access in and out. You will be able to load your pet up as quick as you want and then unload them just as easily. There is a leash hook inside the trailer for securing your pet, and it is a very solid bike trailer that attaches securely to your bike and will not tip over or cause you problems going down the road. Your pet will love all of the different views that they are afforded from the windows provided in this bike trailer, and it is stylish and durable as well. Even though this is the budget option on the list, it is still foreign away a better bike trailer than most of the others on the market these days. When it comes to getting a dog bike trailer, there are a bunch of things that you want to keep in mind. You have to decide lots of different things when you’re buying a bike trailer for your dog. But the most important thing is to make sure that your bike trailer fit your dog. That’s something that we are going to cover in detail in this buying guide. Other things that you may want to be concerned about is how easy the bike trailer is to use, how portable it is and how quickly you can break it down, whether or not you can attach it to your existing bicycle and much more. 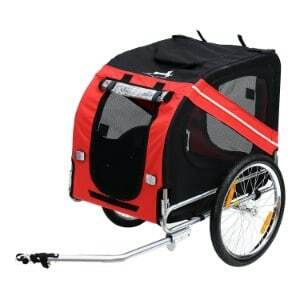 You want your bike trailer to be weatherproof and protecting your pet from the elements, but you also want your pet to be able to look out and see the sights as they are rushing by. You want them to be able to get a little bit of sun while they are out riding around with you. You also want stability and to ensure that your bike is not going to tip over because the bike trailer is not properly balanced. There are many things that you want to keep in mind when it comes to choosing a bike trailer for your pet, and this buying guide will go over all of them so that you can make a decision as to which one to get. You might be wondering just what a bike trailer actually is. A bike trailer is an enclosed unit that attaches to your bicycle which allows you to load your pet inside and take them for a ride with you. There are certain factors that are true with almost every bike trailer out there, such as a lightweight frame and a hitch that attaches to a standard rear wheel on a bicycle, although things like comfort and breathability are important for your pet as well. I bike trailer is a way for you to take your pet with you on long bike rides, especially when they are not able to move at the same speed as your bike or when they are older and have trouble keeping up. There are definitely some considerations when it comes to choosing the right bicycles for your bike trailer. You have to understand what kind of bikes the bike trailer that you have chosen actually fits upon. Most of the bike trailers out there come with the universal hitch that fits on almost all of the adult size rear tires on the attachment near the center. The sprocket attachment right in the center of the tire can be unscrewed and the bike trailer attached. Then the screw gets put back on and the bike trailer is secured. Some of them actually have dual braces that attach from either side, but the problem with this is that bike tires are pretty wide, and very considerably from one to another, so most bike trailers out there do not fit on both because in many cases it would simply not work. The good news is, you can get an extra hitch if you want to attach it to both sides to make sure that it is secure, and even if you only attach one side, you are still going to have a really secure bike trailer as long as you have screwed in the bowl completely. Some bike trailers attach in other ways, but this is definitely the most common out there. Size is definitely the reason the size is so important is that it directly affects what types of dogs you can haul in the trailer. Most of the bike trailers on the market will give you a maximum weight amount for your dog. That means that if you know how much your dog ways, then you will know whether or not they are safe to ride in the bike trailer or not. You can easily go over by a few pounds, but you should pay close attention to this maximum weight amount because it is important. But size also affects how easily you will build to pull the bike along with your own bike. For example, if you get an extremely large bike trailer, it is going to be a lot harder to pull then a smaller bike trailer. If you have an extremely large dog that only fits in the very large bike trailer, then this is unavoidable, but if you have a smaller dog, then you’re going to be hauling around all that extra weight for nothing. Make sure that your dog can move comfortably around the bike trailer. Just like their dog house, they should be able to enter easily, stand up and not feel squashed, be able to turn around in a full circle without running into any restrictions and see out of every side. The type of hitch that your bike has, or can take, is one of the most important things when it comes to choosing the right bike trailer. As you might have figured out by now, most of the bike trailers on the market fit onto the rear sprocket of any adult bike tire, but that doesn’t necessarily mean that they are perfectly suited for every bike out there. In fact, the truth is that most of the bikes out there are probably not going to be best suited for your particular bike tire. That’s because they are tested on a specific number of bike models, and that is usually not a large list. What that means is that you need to do your research and read the customer reviews to find out whether or not it will fit on your bike. You should also find out exactly how many inches are between the ground and the top of your hitch attachment and whether or not that hits attachment actually comes with your bike trailer. You want to make the best decision he can when it comes to matching up the type of bicycle the ride with the type of bike trailer that you get. You want to make sure that they work together in a smooth motion and that means doing a little research to find out if the two transportation models are compatible. Whether the bike trailer handles well or not is a consideration that everyone needs to weigh. As previously mentioned in the last section, if you have a bike trailer that is not perfectly compatible with your bike, then it is going to shimmy and shake as you ride along, and that is going to get more pronounced the longer the ride within the faster that you go. You obviously do not want this to be the case. Instead, you want as smooth a ride as possible and very little chance of your bike trailer controlling your direction or causing you to tip over. Unfortunately, the only way to determine how a bike trailer handles is by checking out the customer reviews on the topic. Customer reviews will tell you a great deal about a product or service. There will be people out there that have tried to attach it to a bike similar to yours, and whether or not they were able to achieve a smooth ride is one of the most important considerations that you need to make when it comes to choosing the right trailer. You can rely on the manufacturer’s descriptions, but it is not recommended as they have a great deal to gain by telling you that is compatible with every bike. You also need to be concerned about the type of flooring that your dog bike trailer has. A dog bike trailer needs to have a waterproof floor and one that is very durable because your dog is going to be sitting in it and walking on it during every bike ride. Most of the dog bike trailers out there, some sort of pad that you can allow your dog to lie down on, but some of them require that you buy your own. However, there are a few things that you need to keep in mind about the type of flooring that you put in. Since a bike trailer is always going to be moving, you have to be sure that whatever you put in place is not going to scrunch up and make your dog uncomfortable. For example, some people line their dog bike trailers with blankets, but if a blanket gets tangled up from your dog trying to make a bed out of it, then it can be a very uncomfortable ride for them because either have to sit on the canvas for or on a bumpy blanket that is not spread out properly. In addition, you have to worry about the collapsible function of your dog bike trailer and whether the bed that you have chosen will need to be removed beforehand. The portability of a dog bike trailer is also important. You want to be able to put your dog bike trailer on the back of your car when you’re traveling, and that means making sure that it does not take up very much space so, you will need to collapsible dog bike trailer. These are pretty standard among the models that are offered, so you shouldn’t have trouble finding a collapsible one, but just make sure that it isn’t too large or bulky even when it is collapsed so as to not fit in your car. This will depend upon what type of car you have and how much storage space and provides, of course. The two main things that you want to look at when it comes to portability is how easily the bike trailer is able to fold down into a flat unit for portability, and how quickly you can remove the wheels. If you have to spend several minutes removing each of the wheels that are included, then lugging it around with you is going to get old after a while. However, if you can simply turn a lever or remove the wheels in seconds, then your bike trailer has a very high degree of portability. You should also be able to collapse it instantly without struggling. If you have to try to remember how to perfectly break it down each time, then it is not as portable as it should be. Ease of use is also a consideration. This has to do with the aforementioned portability, but it also has to do with how easy the bike trailer is to attach to your bicycle, whether or not the zippers get stuck when you open them to put your dog in and various other factors. The hitch is one of the most important things. Most bicycle trailers for dogs attach to your bikes rear tire, but is anyone who has had to change bike tire nose, it is not always easy to remove attire from bike or even remove the nut that keeps your bike tire in place. Of course, this goes to your bike more than it is the trailer, but you should still easily be able to place the trailer hitch onto the bike and connect the two. You definitely want a bike trailer for dogs that is durable. 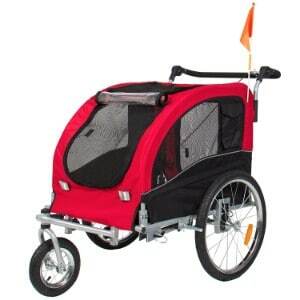 Your dog is going to be riding around in the bike trailer, and that means a great deal of wear and tear on the inside. The canvas or covering material needs to be able to stand up to your dog pressing against it without tearing, even over an extended period of time, and the outer layers need to be able to stand up to the elements without breaking down. In addition, most bike trailers come with bug shields that are much thinner than the other material and you want to make sure that they don’t rip or tear from your dog’s claws. Then there is the durability of the bike frame and the other components that come with your bike trailer. You want to make sure that your aluminum frame is going to last, and it isn’t going to bend or buckle over time. You also want to make sure that your hitch isn’t going to break off due to a great deal of use. The durability of a bike trailers usually reflected in a couple of different ways. First of all, look to see if the company offers a terrific warranty. If they do, that is a positive sign that the product is going to last. You can also check out customer reviews and look for a pattern of breakage after only a few months. When it comes to UV protection, you want to make sure that your dog is not getting direct sunlight that you give him a sunburn or contribute to skin diseases. You want your dog to have UV protection, as well as shade so that he or she does not overheat. Remember, dogs are not able to lower their body temperatures as effectively as humans do. In fact, dogs can only sweat through their paw pads, and the only other way they have to lower their body temperature is by panting. You want to make sure that your dog has shade inside of the bike trailer if he or she desires it. We also have to worry about weatherproofing. If it starts to rain, you don’t want your dog inside of the bike trailer getting wet. That’s why you need to have waterproofing around the outside, as well as protection from the other elements. For example, you want to be able to block sharp wind if you are taking your dog for a ride and the wind is particularly strong or cold. Making sure that your dog is protected against the elements is an important part of choosing the right dog bike trailer. Most of them have these features in place, so you normally don’t have to worry too much about them. Just make sure that they are there. There are some safety considerations that you should be thinking about for your dog bike trailer as well. When it comes to choosing a bike trailer, your primary focus should be on safety, because after all, you want your pet to be safe when riding with them above all else. When you are choosing the best pet trailers for bicycles, you want to consider whether or not an option has safety features included. These can vary from one model to another, but in general, the more of them that are included with a particular bike trailer, the safer your dog is going to be. One of the best safety features there is an efficient handbrake. A handbrake is also known as the parking brake, and it is a safety feature that keeps your bike trailer from moving when your part. If you have to run in a store for a moment, there is always a chance of your bike tipping over and taking the bike trailer with it. The parking brake may not prevent this completely, but it will help to minimize the chances of it happening. In addition, it will prevent your bike trailer from rolling if your bike happens to roll. You also want to make sure that you have a leash inside of the bike trail that keeps your dog from falling over. If you can secure them with an adjustable leash, then going over hills and riding bumps is going to have less of an impact and keep your dog secure and protect him or her from tumbling. These are all important safety features that you should look for when you’re buying a bike trailer, and there may be additional ones not listed here that you can keep an eye out for as well. There are a number of benefits to having a bike trailer. It can be really nice to take your dog on a bike trip with you, but not every dog has the discipline and skill to run alongside your bike without getting in the way. Dogs are distracted easily, and if your dog runs in front of your bike while you are riding along at high-speed he could be seriously injured. Another benefit of the bike trailer is that you are able to take your dog with you on a bike ride even if he or she is not able to get around much anymore because of age or disability. Your dog still loves to go out and see the world, even if he or she is unable to take walks like they used to, and putting them into a bike trailer and taking them for a ride allows them that opportunity. Plus, some dogs simply cannot keep up with the bike even if you go really slow. If you have a small dog with very short legs, they are not going to be able to keep up with your bike. They can barely keep up with you when you walk. While you should still definitely take them on walks and give them exercise, taking them for a ride in a bike trailer can be a major thrill. The bottom line is that there are plenty of things to keep in mind when it comes to buying the right dog bike trailer. You want to make sure that your dog is safe and secure when writing a bike trailer, and you want to make sure that you can carry it around easily in that it has as much convenience as possible. In addition, you don’t want to pay too much for a bike trailer, and that’s where the reviews listed above will help. Hopefully, this buying guide will give you all the information that you need to be able to choose the perfect bike trailer that not only fits your bike but it also fits your pet in your life perfectly. There are lots of factors to weight and lots of things to consider, but getting the right trailer can mean a wonderful experience for you and your dog.